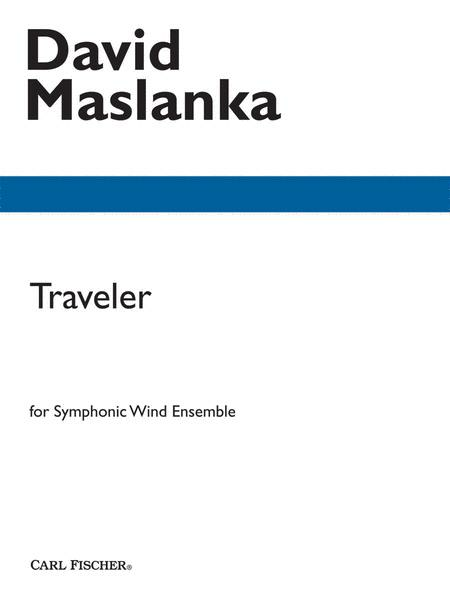 David Maslanka's Traveler, for Symphonic Wind ensemble, was commissioned in 2003 by the University of Texas at Arlington Band Alumni Association, the Delta Sigma chapter of Kappa Kappa Psi and the Gamma Nu Chapter of Tau Beta Sigma, in honor of the career contributions of Ray C. Lichtenwalter, retiring Director of bands at UT Arlington. Maslanka writes, "Ray has been a close friend and champion of my music for many years, and it was a great pleasure for me to write this piece for his final concert. The idea for Traveler came from the feeling of a big life movement as I contemplated my friend's retirement." 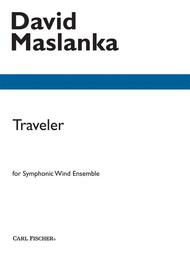 Carl Fischer Music is excited to make this beautifully contemplative piece available to wind ensembles everywhere. Instrumentation: Piccolo, Flute, Oboe, Clarinet in E-Flat, Clarinet in B-Flat, Bass Clarinet in B-Flat, Contra Alto Clarinet in E-Flat, Bassoon, Contrabassoon, Soprano Saxophone, Alto Saxophone, Tenor Saxophone, Bass Saxophone, Horn, Trumpet in B-Flat, Trombone, Bass Trombone, Euphonium, Tuba, Double Bass, Piano, Timpani, Percussion 1 (Xylophone, Vibraphone, Temple Blocks), Percussion 2 (Marimba, Bibraphone, Crotales, Tam Tam, Lg. Susp. Cym), Percussion 3 (Small Suspended Cymbal, Tom Tom, Bass Drum, Small Triangle, Small Crash Cymbals, Sleigh Bells, Orchestra Bells), Percussion 4 (Maracas, Small Snare Drum, Bongos, Tom Toms, Bass Drum, Wood Block, Large Suspended Cymbal, Large Triangle).